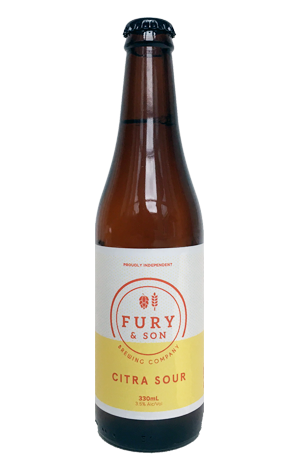 Heading into summer, Melbourne's Fury & Son has entered the world of sour beers. Well, sort of. Their summer 2017/18 seasonal is the Citra Sour and is most definitely seasonally appropriate and distinctly Citra-fied; it's not particularly sour, however, but that's no bad thing and, presumably, by design. It's a pale straw pour, one in which any head soon dissipates to the extent you could pass it off visually as a glass of white wine and in which the aromas are dominated by the citrus and passionfruit aromas of the Citra hops. There's little to hint at its bug-enhanced underbelly other than, perhaps, a touch of lemon. The acidity contributes to a spritzy carbonation but provides little in the way of anything overtly sour; it's light and cleansing more than anything, with those tropical, citrusy fruits still dominating the flavours right through to the finish in what – at just 3.5 percent ABV – makes for a cracking hot weather refresher.